Scooping ice cream is tougher than it looks. Rows and rows of rock-hard ice cream can be brutal on the wrists. As a teenager working behind the counter at Baskin-Robbins in Honolulu, I was less interested in what the job meant for my future and more concerned about what it meant for my jump shot. My first summer job wasn’t exactly glamorous, but it taught me some valuable lessons. Responsibility. Hard work. Balancing a job with friends, family, and school. That’s the story of so many Americans. Access to a job in the summer and beyond can make all the difference to a young person – especially those who don’t have access to many resources and opportunities. Employment can also help bridge the “opportunity gap” we see in the summer months, when young people tend to fall behind in educational achievement. Too often, those idle summer months are when they make mistakes that might get them in trouble with the law and set them down the wrong path. So we know that these opportunities matter. But right now, landing that first job is all too difficult for students, and even harder for the one in seven young Americans between the ages of 16 and 24 who are not in school and don’t have a job. When you’re just starting off in the working world, the prospect of finding a job with a blank resume, limited education, and no meaningful connections to employers can be daunting. This is where our communities can play a big role. We can make sure local businesses create summer job opportunities for young people who need them, and extend those opportunities throughout the year. That’s why today, we’re kicking off a Summer Opportunity Project that brings together state and local leaders, community organizations, schools, and businesses – including LinkedIn – to get young people into their first jobs and create strong transitions between school years and from high school to college and careers. My Administration has called for investments in first jobs for young people, and I hope our leading companies will step up to do the same. We’re going to do our part. But preparing our kids for the future is going to take all of us working together. So here’s what I’m asking you to do: If you’re an employer or business, give more young people their first job this summer. Work with your communities to recruit, train, and mentor young people who are out of school and work. Businesses are already answering the call: In Baltimore, Veolia Transportation brought young people from the community onto their teams as part of a city-wide summer jobs program. At 16 years old, Stephanie Odom joined the team at Veolia as an office clerk, giving her a crucial first foray into a professional work environment. Growing up in a part of Baltimore where many of her fellow classmates didn’t have support at home, Stephanie took the opportunity at Veolia, giving her an array of new perspectives and new connections that she still references when applying for new jobs. At the end of the summer, she extended that job to be part-time during the school year, and today, at 19 years old, she is attending college to one day become a school psychologist who will help other students realize their full potential. This is just one story of the millions of young Americans who have been given a chance to contribute to their communities with the help of a local employer. That’s what my first job did for me all those years ago. 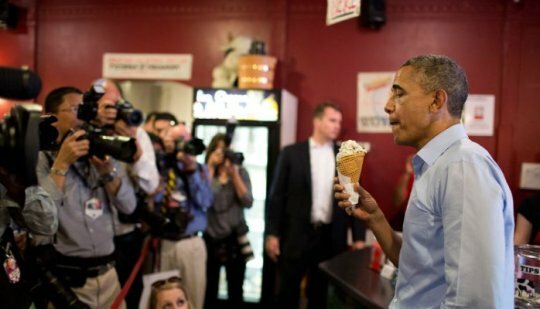 And while I may have lost my taste for ice cream after one too many free scoops, I’ll never forget that job – or the people who gave me that opportunity – and how they helped me get to where I am today. Let’s make sure every young person knows that, in America, we’re all committed to helping them achieve their dreams. More stories via the LinkedIn post HERE.